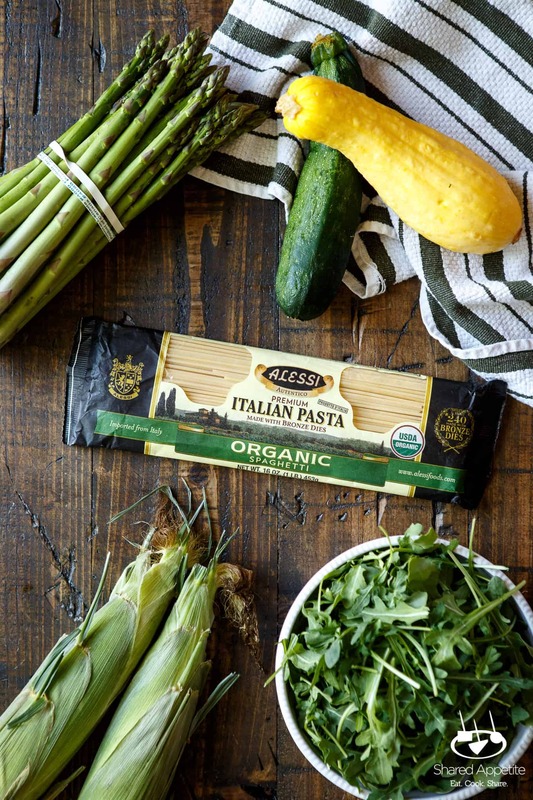 This Summer Vegetable Pasta with Arugula Pesto is brought to you in partnership with Alessi Pasta. As always, all opinions and recipe are my own. Thanks for supporting the brands that support Shared Appetite! Summer. It’s a word that gets most people excited. But for teachers… summer is everything. Ahhhh, you have no idea what an amazing feeling it is that everyday is “Friday” for me for the next two months. The alarm clock has been turned off. My wardrobe currently consists of only t-shirts and mesh shorts. The most stressful decision I have to make on a daily basis is what flavor ice cream to have. And most importantly, I get to spend the next 10 weeks with my sweet little girl. Life is GREAT. You know what else I love about summer? All the amazing produce. Here in NY we spend all winter waiting… and waiting… for the weather to warm up so we can get a taste of summer’s bounty. And now it’s here. I’m talking amazing asparagus, zucchini, squash, corn, lettuces… the farm stands are filled to the brim with options! So here’s the deal. No one likes turning on their oven over the summer, but I still love to to get my fill of pasta during these warmer months. There’s nothing more satisfying than that perfect bite of pasta, am I right? 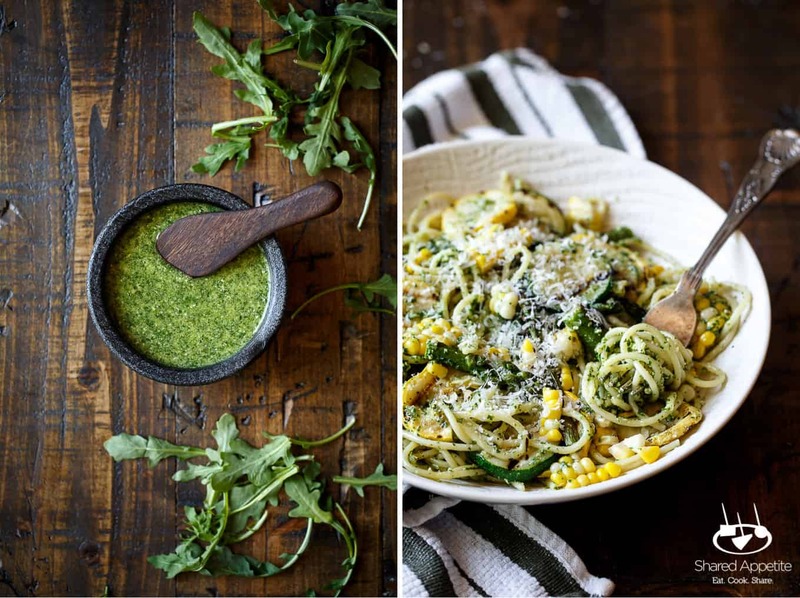 That’s why this Summer Vegetable Pasta with Arugula Pesto is so perfect. It takes advantage of fresh, local produce and keeps things light (you know, so you don’t have to wait those 30 minutes before getting back into the pool). The best cooking throughout the summer is done outside (preferably with a drink in your hand). 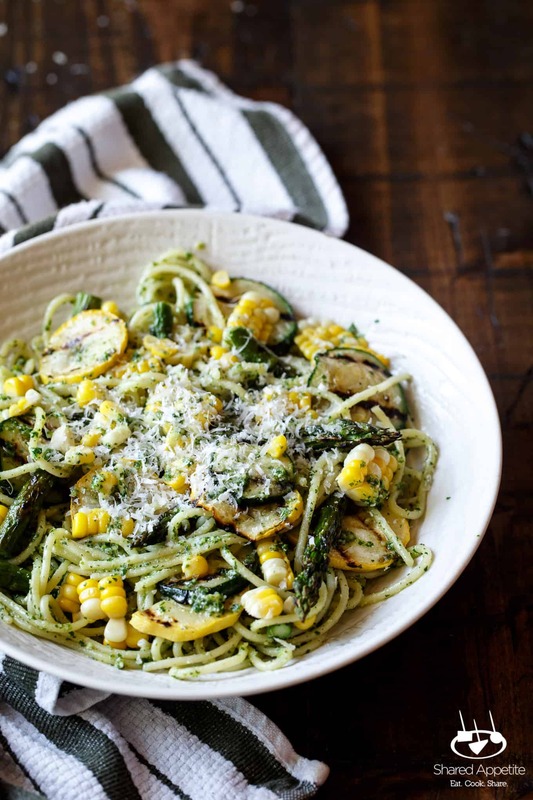 I fired up the grill to quickly cook all the asparagus, zucchini, squash, and corn for this Summer Vegetable Pasta with Arugula Pesto. Of course you could feel free to sauté or roast the vegetables if you find yourself without the option of grilling. And listen… don’t stress too much. If you prefer different summer vegetables, feel free to substitute them in. Cooking for these next few months should be anything but rigid. Summer is too short to fuss. I know you’re not new to pesto. It’s my favorite way to use up all the basil I have growing away in my yard. But did you know that you can get all crazy and make pesto with pretty much anything? That’s right basil. You’ve been replaced. This arugula pesto is such a nice variation on the classic, and gives the pasta a beautifully fresh peppery bite. If you don’t have pine nuts (or just don’t want to buy them because they are kind of stupid expensive), try this arugula pesto with walnuts instead. You won’t be disappointed, I promise. 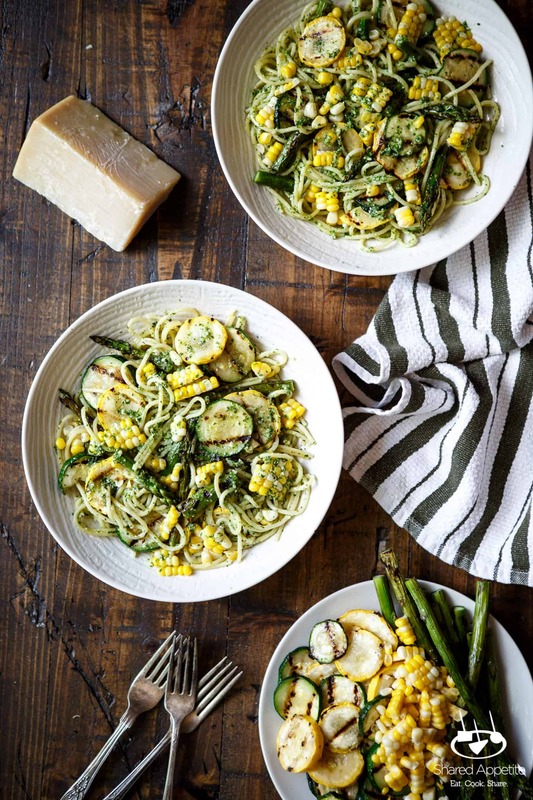 In true laid-back summer fashion, you can feel free to grill up the vegetables and whiz together the pesto either right before serving this Summer Vegetable Pasta with Arugula Pesto or make ’em up to a few days in advance. Grilled vegetables refrigerate very nicely and the pesto will last in the fridge for up to a week. Just make sure to cover the pesto with a thin layer of oil and cover with plastic wrap to avoid it browning. 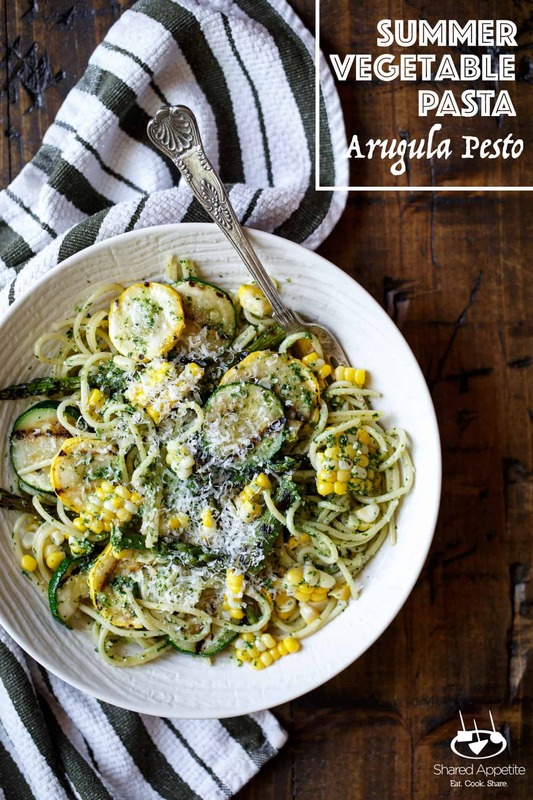 When ready to devour this Summer Vegetable Pasta with Arugula Pesto, feel free to serve it hot or at room temperature. I actually prefer it not piping hot, since I’m usually in a constant overheated state anyway throughout the summer. 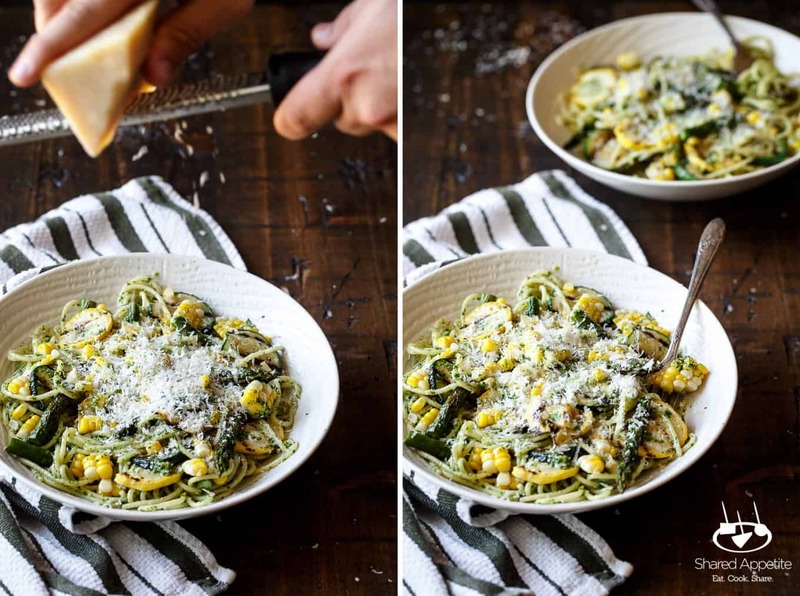 The star of this Summer Vegetable Pasta with Arugula Pesto, of course though, is the spaghetti. You can’t have a great pasta dish without, well duh, great pasta. And please, I urge you… cook up your pasta al dente. Mushy pasta has no place on your dinner table. 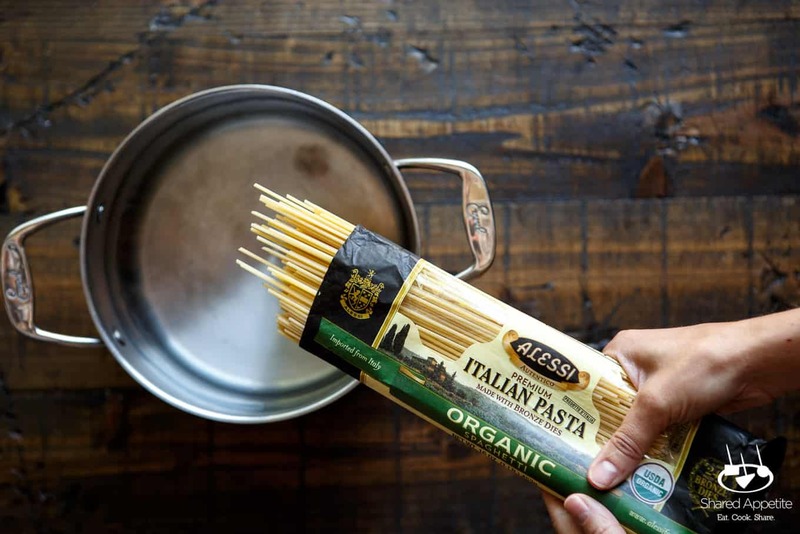 Let’s talk Alessi Pasta. It’s super high quality, made with wheat grown in the heart of Italy and using a centuries old practice of pressing the pasta dough through bronze dies. This helps the pasta have a more porous texture, allowing it maximum opportunity to absorb up sauces. 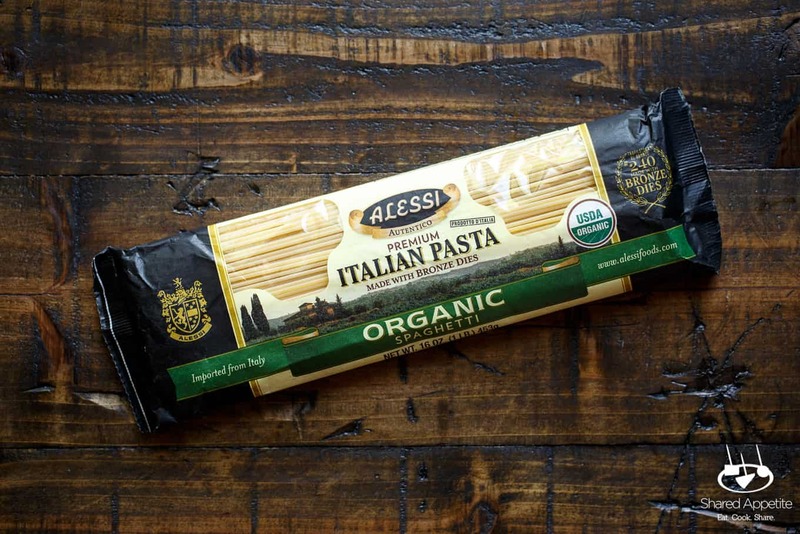 I loved this Alessi Organic Spaghetti. It cooked up a beautiful golden color and had that perfect quintessential toothsome texture that all pasta should have. You might have seen Alessi products beyond the pasta aisle. They have a full line of specialty Italian products, from tomato sauces to vinegars. They’ve been doing their thing since the early 1900’s, when the Alessi family emigrated from Sicily to America. You better believe that any company that is THAT old and still going strong is doing something very right. Even after all this time, the Alessi family is still very involved in the brand. You can check out their vast product on the official Alessi Foods website. They even have an online store, so you can get this organic spaghetti shipped right to your doorstep. Preheat grill over medium high heat. Grill corn for 15-20 minutes, turning every 5 minutes. Meanwhile, brush sliced squash, zucchini, and asparagus with oil and season generously with Kosher salt. Grill vegetables for approximately 5 minutes, turning once, until just cooked through. Remove all vegetables from grill and allow to cool slightly. Slice asparagus into pieces. Remove husk and silk from corn and slice kernels off the cob. Cook pasta according to package directions in a large pot and drain. 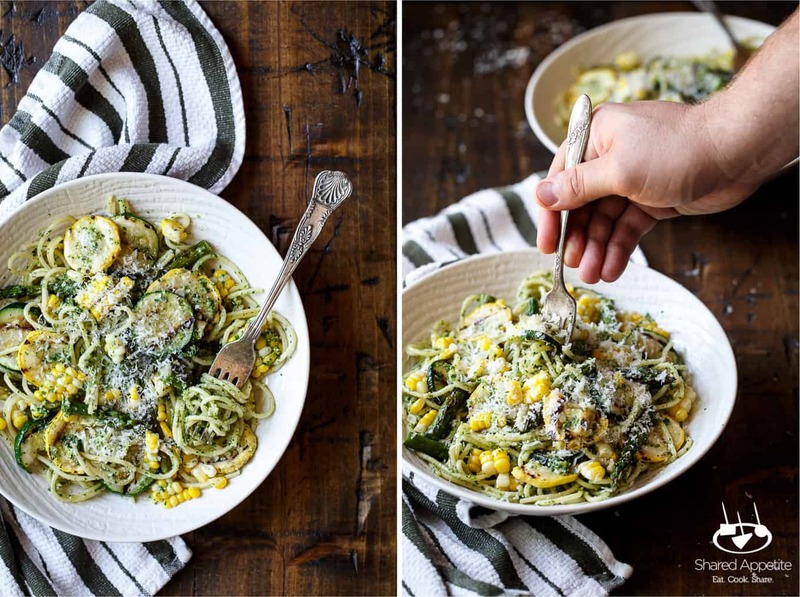 Add pasta back into the pot and add grilled vegetables and arugula pesto. Toss to coat. Divide pasta between four bowls and top generously with grated parmesan cheese. Place all ingredients in a food processor and combine thoroughly. Season with Kosher salt. My favorite parmesan cheese, by far, is parmigiano reggiano. It’s worth the price and really helps make this dish special. Look yummy,, All ingredients are very healthy. I gonna try to make this I hope so my grandpa like it because she always like healthy food and corn her favorite.